Eight years ago the girls had a slumber party. There were six of them: Lara, Rachael, Mindy, Dana, Nell, and her little sister Nicole. Perhaps the trouble started with the Ouija board. Perhaps not. Either way, it was a night that the five survivors of the party would never forget. Now they are having another party and Lara has invited her new friend, Celeste. So, once again there are six of them, but they aren’t getting together for a slumber party this time; they intend to spend the weekend skiing. They don’t meet up often and all of them carry scars from the night of the slumber party eight years ago. Most of the girls carry their scars on the inside, but Nell has a few external scars too. She got them when she tried to save her sister from the flames. The first strange thing to happen is the snowman. It’s somehow melted, regardless of the bitter weather. All that remains of it are its scarf, the sunglasses and a cowboy hat, resting in a concave circle of ice. It’s a real puzzle. Then one of the girls goes missing and one of her skis is found near another circle of ice frozen into the snow and—to make things worse—a storm is coming in. Lara is the main character in Slumber Party and she would also probably be the most attractive member of the gang if it wasn’t for Rachael. Rachael is a real stunner and she knows it. Lara knows it too and admits to herself that, in the looks department, she can never hope to compete with her friend. When both girls fall for the same guy though, and that guy seems to be more interested in Lara than Rachel, a rivalry develops between the two friends and this little love triangle continues for most of the book as an interesting little sub-plot. Slumber Party is part mystery, part horror (slightly), and part love story. It is a very entertaining read and some of the scenes are amusing enough that they brought a smile to my face—and it takes a lot to do that—so it is not all doom and gloom in the snow. 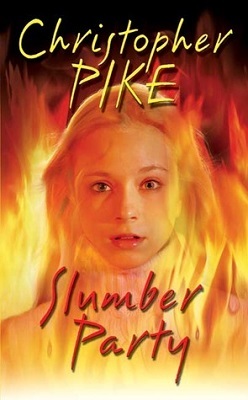 At only around 128 pages, Slumber Party is not a long book, and is probably more novella length than a novel, so it would be an easy matter to read the whole book in just one sitting. Throughout the book, the reader is always aware that something mysterious is happening and I was very surprised when I reached the end of the book and found out what that something was. In fact, I received more than one surprise when the truth of the situation was revealed.